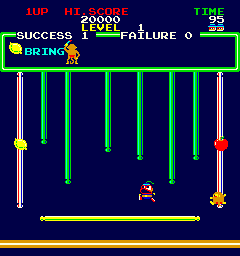 Minky Monkey © 1982 Technos. Even if titlescreen says 1982, the game was released in March 1983 in Japan. This is the first Technos game. Produced in association with Roller Tron Corp., Ltd.